The official notification of SSC Combined Higher Secondary Level (CHSL) 2015 exam will be made available in the month of April and the exam will be held in July, 2015. The recruitment exam of SI in CAPF, ASI in CISF, SI in Delhi Police will be in May. The SSC Constable (GD) exam 2015 will be held in Feb-March (PET) and July (written exam) and Junior Engineer (Civil, Electrical & Mechanical) exam 2015 will be in August. Both SSC Stenographer (Gr. C & D) 2015 exam and Jr. Hindi Translator exam will be held in September, 2015. 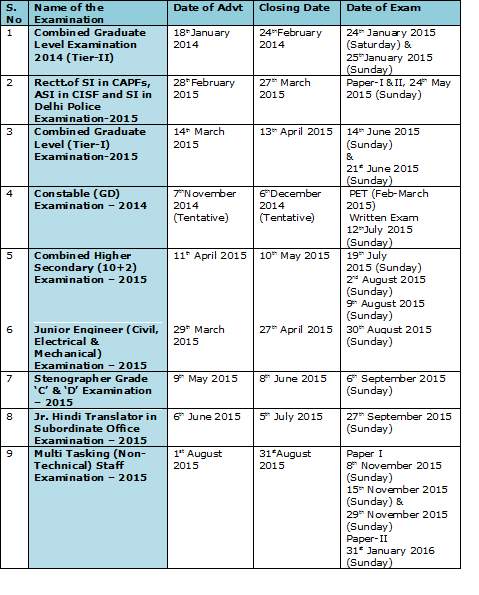 Now let's have look on the entire calender of SSC recruitment exam in 2015. So friends, start your preparation from now. Don't waste your precious time! 0 comments for " Official Exam Schedule of SSC Recruitment 2015 "